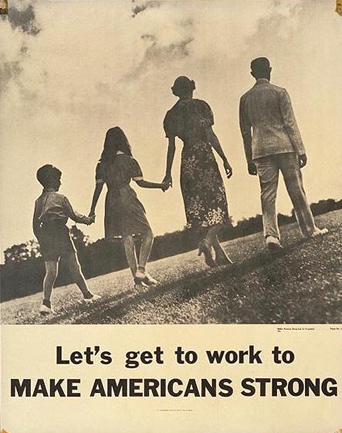 Let's get to work to make Americans strong. Photo showing the back view of a family (boy, girl, mother, father) holding hands and walking together, with the man leading the way. World-War-2.info is the best resource for World War 2 information available on the Internet. We offer information on World War 2 History, World War 2 Timeline, World War 2 Facts, World War 2 Quotes, World War 2 Pictures, World War 2 Posters, World War 2 Propaganda, World War 2 Aircraft, World War 2 Weapons, World War 2 Battles, World War 2 Memorials, World War 2 Links, and more. © 2019 World-War-2.info. All Rights Reserved.